I think Ben said it best when he declared Charleston to be a town you could just melt into and never leave. We felt so at home in the south, taking in the scenery, laid back lifestyle, and strolling our days away. Vacation never felt so sweet! I love how downtown Charleston has a couple of different sides to it. Centuries-old cobblestone streets still remain in parts of the French Quarter with upscale dining establishments just around the block, and influences from Europe to Miami can be seen in the enviable homes that line the peninsula. 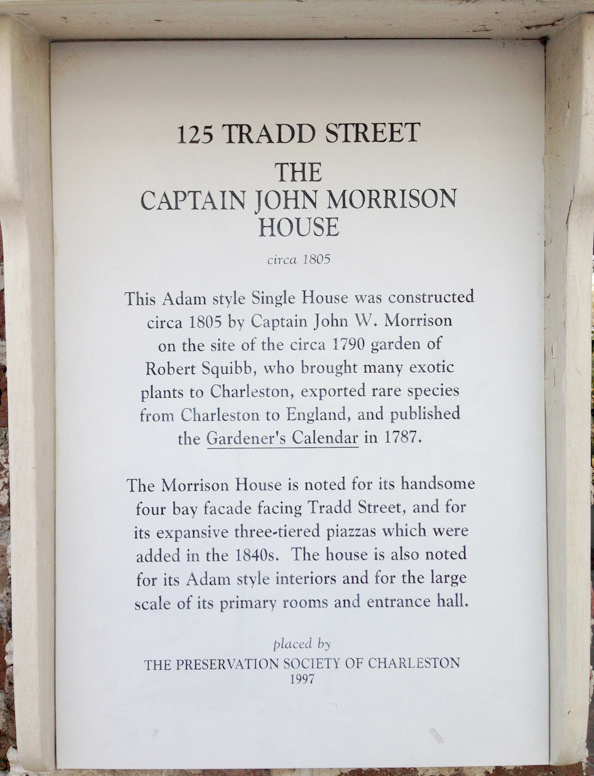 As a history lover, I, well, love, the fact that many places in the area (including private homes, shops, and businesses) have placards with the history of the building on them – some dating back to the early 1700s. I always forget how “old” the east coast is compared to the rest of the country. I think that’s so neat! As I mentioned in previous posts, the food in Charleston is not to be missed. From regional snacks like boiled peanuts (crazy! 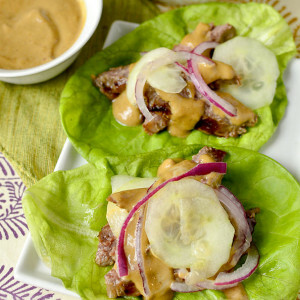 ), to re-imagined dishes like pig ear lettuce wraps, and staples like Chicken & Waffles, the splurges were well worth it. 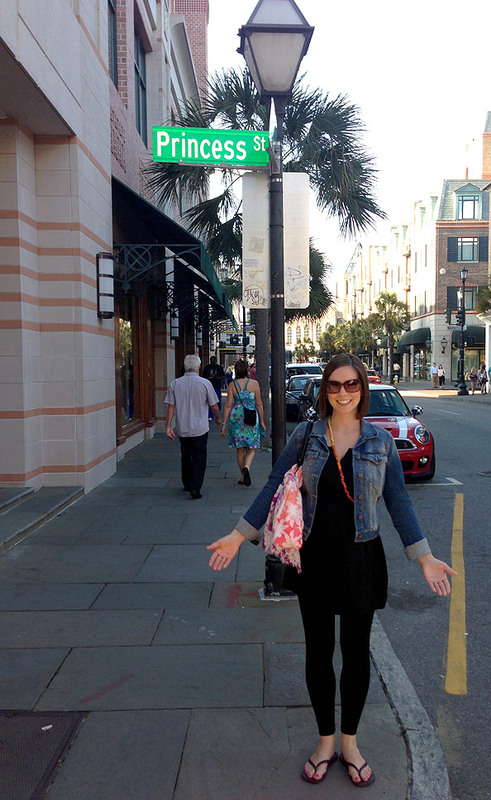 One thing I was surprised by is how OUTSTANDING Charleston’s shopping scene is. 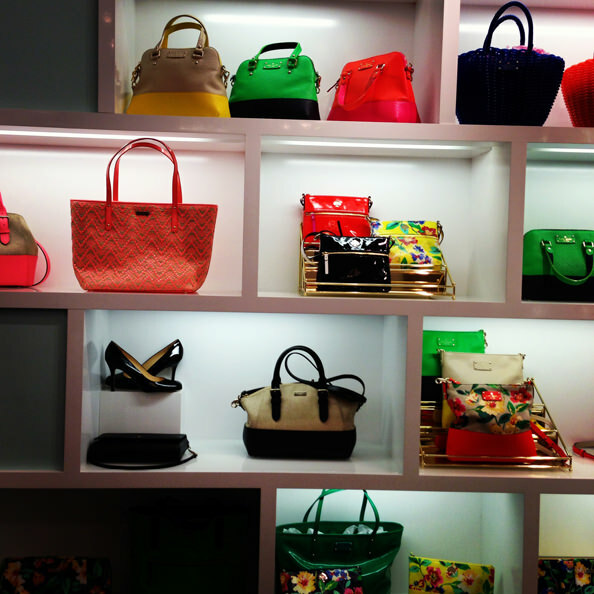 Like, some of the best shopping I’ve seen anywhere, ever. The main shopping district on King Street is lined with upscale brands like Cynthia Rowley and Louis Vuitton, fun and more affordable shops like Anthropologie and Kate Spade (ok still not that affordable) but the kicker is all the boutique shops filled with adorable dresses, jewelry, bags, and shoes that also dot the street. Ben and I were both pretty happy that I’m not able to fit into anything right now because I could have done some serious damage this past week! 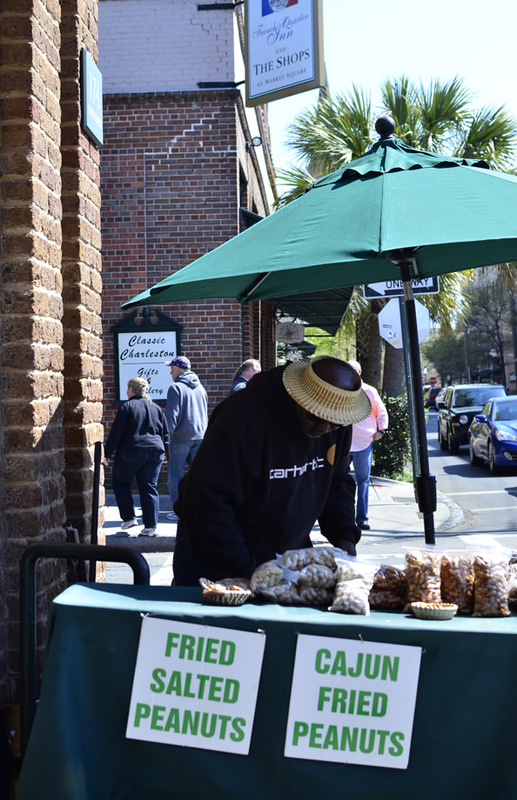 I always say the best way to get to know a new place is to see it on foot, and lucky for us Charleston is a true walking town. 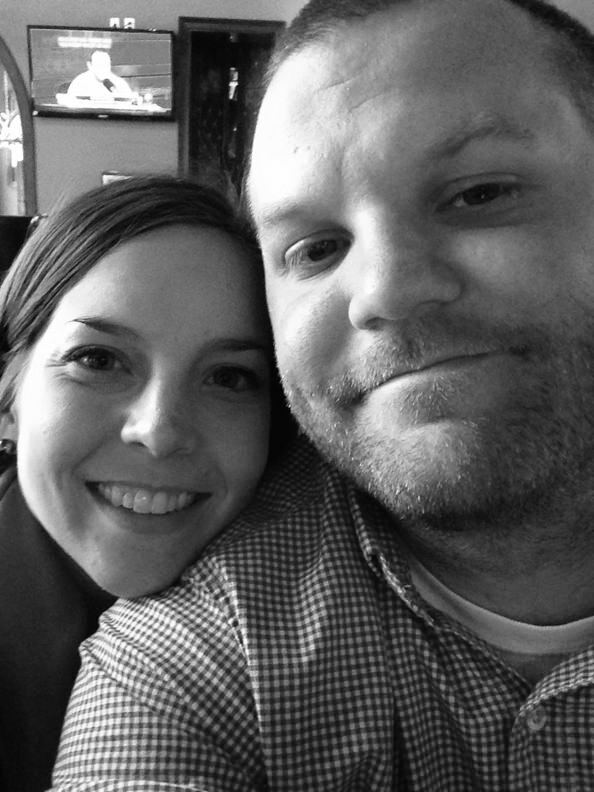 Ben and I walked everywhere – I’d say between 3-5 miles a day. Between the gorgeous waterfront and house gazing, it wasn’t hard to rack up the miles. 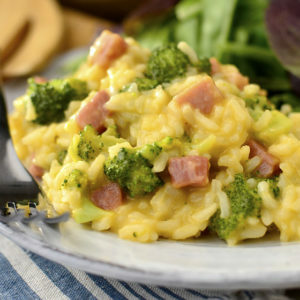 Helped negate our heavier dinners, too…right? RIGHT?! While the hotel was beautiful and clean, it was definitely built in a different era. The rooms are small and bathrooms even smaller with needs for updates. If I were you, and the budget allows for it, I’d stay at a nearby B&B to get the true Charleston experience in an old, Victorian-esque home. The Francis Marion was not bad at all, and we were only there to sleep and shower though, so no biggie! With that, it’s back to the real world for us! Charleston was a dream, but alas, it is time to wake up. Thank you for coming along with us! Back to regularly scheduled programming tomorrow. I hope you had a great weekend! Yay! We got the side belly shot! You look great! I never would have thought to add Charleston to my vacation/travel list but after your reviews, it is heading straight toward the top! I am so glad to hear you had a great time :) The food and the shopping and the history sounds absolutely wonderful. Now you have to try the real chicken and waffles made in Lancaster County, PA. I didn’t even know the rest of the world had fried chicken on top of it until I ordered it on vaca one day… so weird. Yay baby-bump! So lovely.. you are beautiful! Your bump is just the the cutest. You are the prettiest pregnant lady, ever :) And thanks to you I think I found a new vaca spot to put on my bucket list. Your pictures are gorgeous and I love all of your reviews of restaurants, shops, etc. Charleston is beautiful. Glad you guys had fun! Thank you for all the information about Charleston. We have talked about visiting, and you helped us make a favorable decision. This makes me want to go back to Charleston! 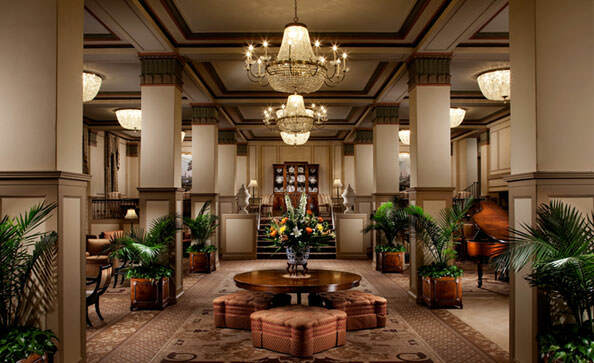 We were there about a year ago for a wedding and stayed at the Francis Marion as well. The room was small but I still can’t get over how TINY the bathroom was! I called down and they said every room was this small and building permits would not allow them to renovate/make them any bigger. Almost felt like a NYC hotel room, but worst! Glad you had a great time! Hopefully this doesn’t come off as creepy because I don’t even know you – although I FEEL that I know you through your blog – but I had a dream you bought a new house, and Ben had a HUGE beer brewing room. 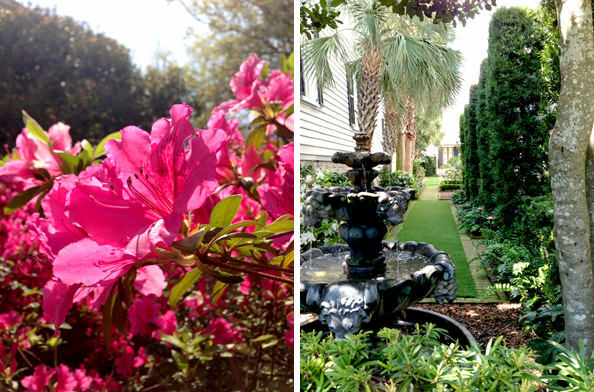 Lovely pictures of Charleston – you’re inspiring me to travel! I never had boiled peanuts until I moved to the south, but they are actually sort of awesome. The Southeast is fabulous! I grew up in the Twin Cities but moved East after college, then married a Carolina boy and kept moving further south. I could NEVER EVER live in the Midwest again. For me the South takes it every time. Such special people too. Glad you had a good trip. Thanks for taking us along on your fabulous vacation! The trip was great. Thoroughly enjoyed ALL those pics. Glad you had a good time and good weather too! Safe travels to you and Ben. Looks like a great vacation! I’d love to visit there sometime. I love the east coast so much. That’s it! 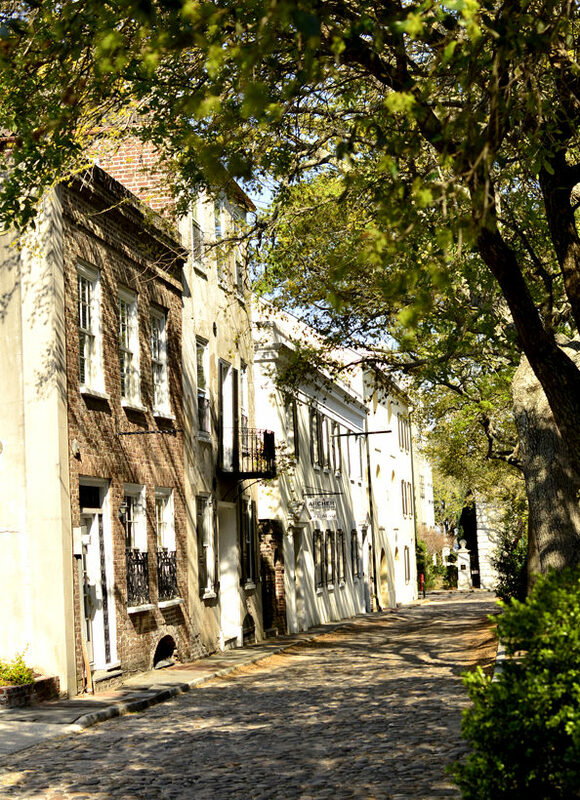 Charleston is officially on my list! Chicken and waffles? Wow I think my boyfriend would die and go to heaven if he saw let alone ate this. Glad you guys had fun :) Love the photos. What a beautiful place. I now want to go to Charleston. I wonder if I can talk the hubby into going? What a blast!! Love your bump! I lived in Charleston for 2 years and if there was ever a city I could move back to it would be that one. I rave and rave to everyone that has never been to go. It truly is a like being on vacation when you live there. I am taking my two teenage daughters there this summer for a mother/daughter trip. Can’t wait! Love South Carolina!! I vacation in Pawley’s Island at least once a year, and I haven’t been to Charlston in a few years. This year I am putting my foot down and making day trip there! Loved reading your posts and seeing your photos, made me wish my trip was closer! 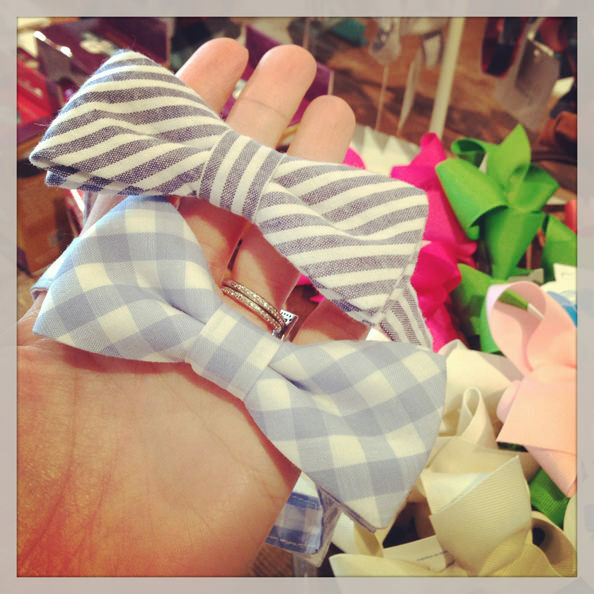 PS- those bow ties are ador! ohh congratulations on your pregnancy! :D You’re looking great and healthy~which is most important. 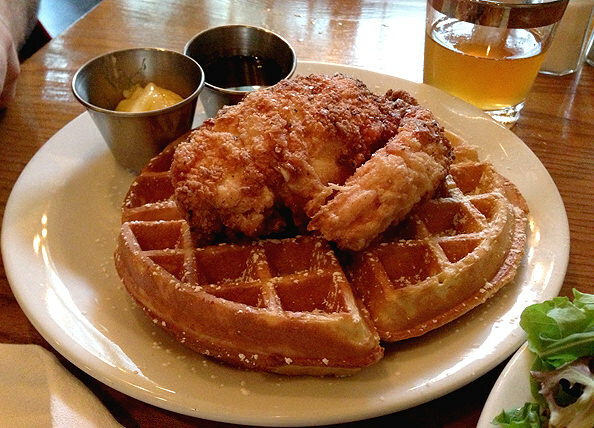 And omgsh that food looks delicious, and I’ve never tried actual chicken and waffles. Charleston is so darling and I wouldn’t mind visiting there ooooone bit. You have officially convinced me that I NEED to see Charleston! It looks like such a lovely Southern town. The way you describe sounds similar to how I felt about Austin, Texas the first time I visited! You showed us your bump! Bless you! :) As I was reading the post, 1st there was a pic of your back as you were walking away & then another one of your front, but w/ a black dress & denim jacket, you can’t see the bump at all, & I was like, “She’s such a stinker!” (You’re a tease is what you are!) ;) Thx for showing us! So excited for you!! & you look terrific btw! Glad you guys had a good time in Charleston. I would not have considered Charleston as a possible vacation spot, but it has been added to our list. I have always wanted to visit New Orleans, but been a bit leery because of safety/rowdiness concerns. Charleston looks a little more our speed. Also, you look fabulous and thanks for posting a bump picture. 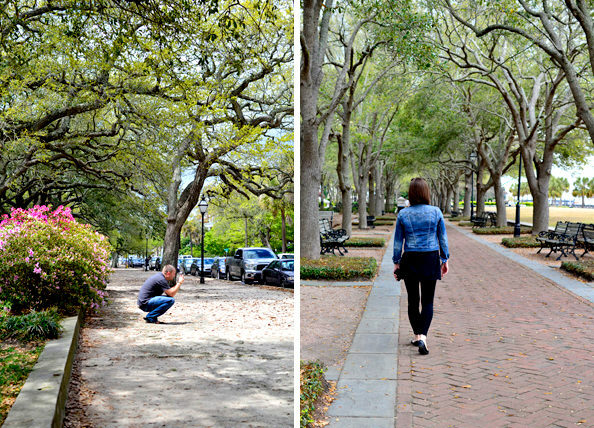 Charleston is the best–I loved reading your adventures. Especially the food. :) I have yet to try most of the restaurants you hit up so they are now on my list! I am super behind on reading your blog (all blogs really). What is funny is I saw this post come across my email and it specifically peaked my interest because we booked a trip to Charleston at the end of the month! What is funnier is that I am pregnant too :) I am 17 weeks now! I will definitely read your other Charleston posts to get some insight! Thanks! Congrats, Suzanne! You will LOVE the city – we miss it so much! Thanks! Congrats to you as well :) We loved your restaurant reviews and are looking forward to our trip even more now!! You look amazing, happy and healthy! I can’t wait to go there with my daughter! Charleston looks so beautiful! It reminds me of the beautiful squares in Savannah! 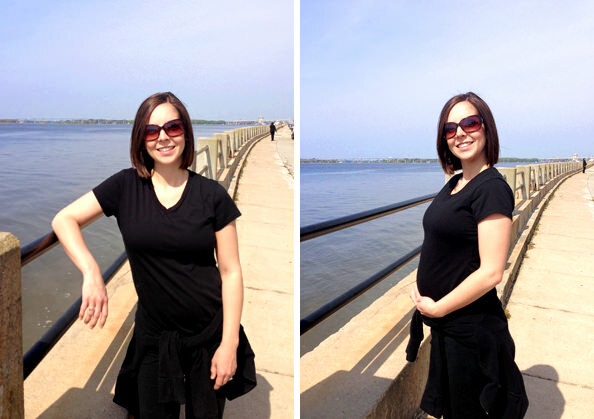 You, your bump, and Charleston are just tooooo cute! Ahhh, this makes me SO excited for our trip there in a month!! (not in the least because we are now on day 6 of snow/sleet/freezing rain here in Minnesota) We currently have reservations for Husk, and are planning on doing Shem Creek one night for something more casual. Now questioning if we should switch to SNOB?? SO hard to narrow it down!! We’re only there 2 nights, and I could be there for a full week and not try everything!! 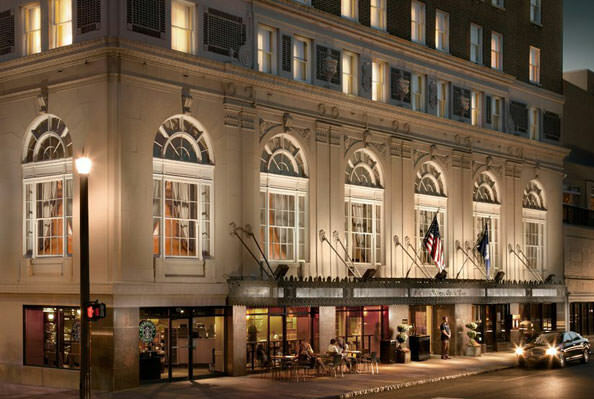 We’re doing 2 nights there, and then 2 nights in Savannah – so excited! Loved reading this. I live in Columbia, South Carolina and we are in Charleston all the time. 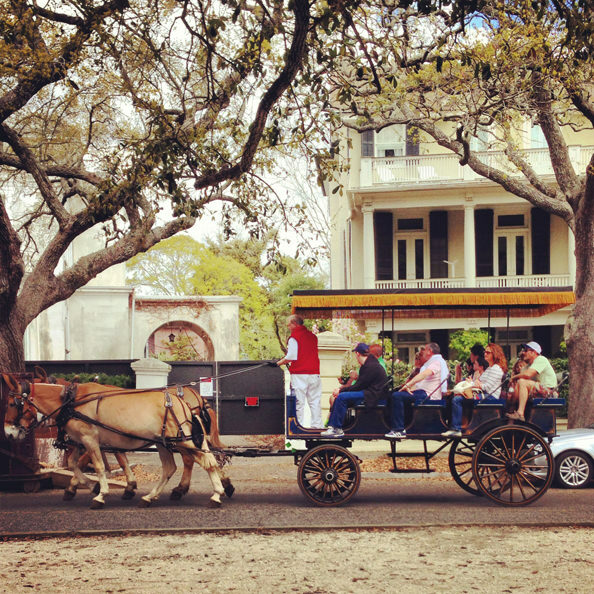 So excited that you got down here and got to experience our “southern charm”! Great trip! We’re going to use your blogs as a guidelines for our ladies weekend there this summer. Did you get a rental car or would it be feasible to walk/cab most places? Thanks in advance! Love Charleston! The Shrimp and Grits and Hymens is awesome!